Many Britons will celebrate Shrove Tuesday by flipping a traditional pancake but scientists think they have discovered the mathematical secrets of the pan. The angular velocity of the object equals the square root of Pi, times the gravity divided by the distance the pancake is from the elbow times four - that is how to get the pancake back in the pan. It is a conundrum that has taxed pancake flippers since the dawn - how to avoid ending up with batter on your ceiling. But now scientists in Leeds University say the miracle equation they have chanced on will leave pancake-makers mess free. It will make sure the pancake will land back in the pan, as long as you understand the formula. Meanwhile, according to the results of a survey released by supermarket chain Asda, 83% will be battling with pancake mix on Tuesday. But only 11% of the 400 people questioned were bullish about the prospect of flipping pancakes. People in Scotland and the north of England were the shyest about their pancake mastery with only 4% believing there would be no batter splatter. In the south, nearly one in five - 19% - were sure they were pancake sharpshooters. Student Stephen Wilkinson was the mastermind behind the pancake formula as part of his research for a physics degree at Leeds. His theoretical work laid the groundwork for students designing a pancake-tossing machine, which could one day become a feature in every home. The 21-year-old explained the formula: "'W' is the angular velocity of the pancake, 'g' represents gravity and 'r' is the distance from the pivot - the elbow - to the centre of the pancake." 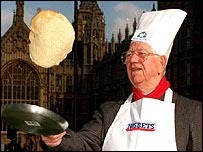 Meanwhile, Asda's Ali Carswell said: "We're confident that crummy crepes will be a thing of the past." The survey also found half of all those questioned north of the border like cheese in their pancakes. In the West country, pancake lovers had a sweeter tooth, with jam and Golden Syrup the favourites, while 60% of the UK's population still enjoy lemon and sugar on their pancakes.